What do you think about bar end shifters? Do you use them on your strict C&V builds? I've been thinking about how to make my 1978 Team Pro more rideable. One issue I have with the downtube shifters (Simplex retrofrictions) is that I am not coordinated enough to shift when riding out of the saddle. So if I'm, say, pushing hard on a hill and the grade eases so that I want a bigger gear, I have to sit down, shift, and get up again. I've gotten used to simply shifting while staying up, using brifters and Gevenalle shifters. I do recall from prior bikes with bar ends that sometimes my knee hit them when sprinting or climbing out of the saddle. I don't know if those bikes were perhaps poorly sized for me. So, the book on the Ti-Raleigh teams shows a few team bikes with bar ends, in races. Apparently a few of the team riders used them, back in 1976-1980, and thus I could try bar ends without losing the "correctness" that is important for this particular bike in the fleet. I have a suitable set of bar end shifters and some CLB alloy housing that I could install. One thing I wonder is if Benotto tape works well when wrapped over housing. The other is if I should try to adapt the retrofrictions for bar end use, and how. 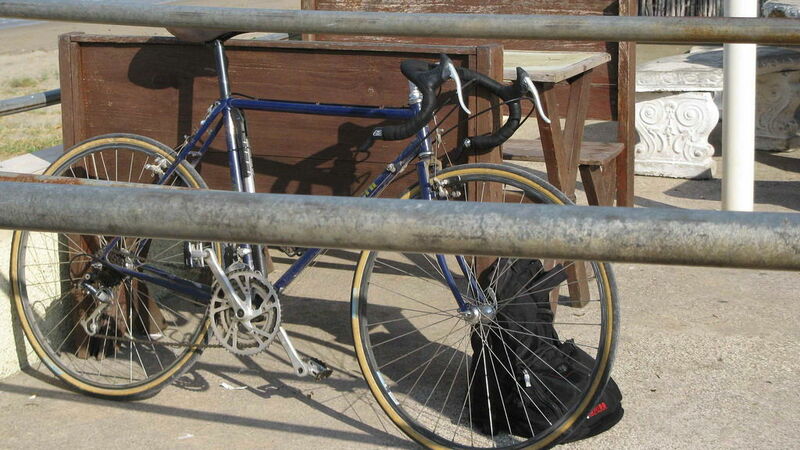 I use barcons on my vintage bikes, including both my Masi and my Holdsworth-copy made by Rodriguez. I can’t see why Benotto tape would not work well over the shift housing. Dunno about the retrofrictions, though. How compatible are the innards with Shimano or Suntour bar controls? Do it, I have never had any but them until the Paramount was recently acquired and it is likely going to get them as well. Don't know about the Benotto but I'm sure it was used back in the day. I put them on the Bruce Gordon and they came on the green Merz. I have long legs and almost never hit them, but also almost never ride out of the saddle. Can't imagine riding without them. I am pretty sure bar end Retrofrictions exist, but finding siome might be a challenge. I would probably just go with Suntour. 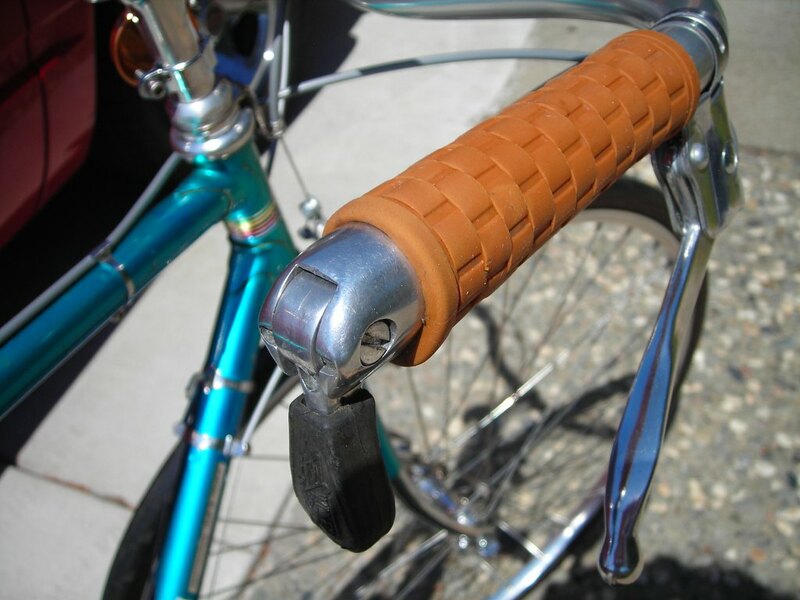 Yes, Bar end (Simplex) retrofrictions do exist. I've got bar-ends on multiple bikes. I like them. 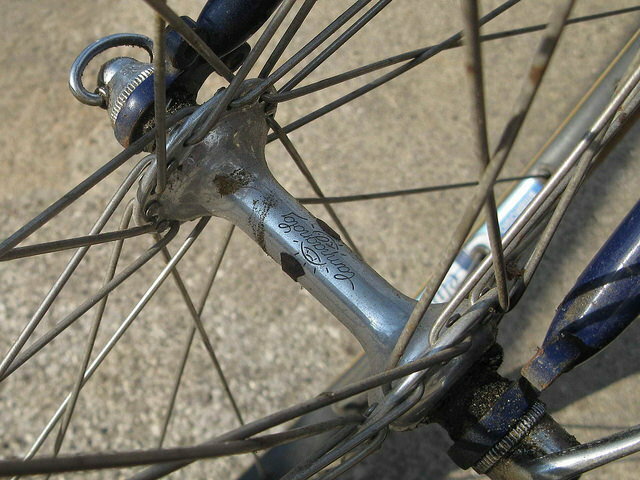 Bar-end shifters can be shifted out of the saddle, although it's still clumsier than with brifters. The hand doing the shifting is out past the ends of the drops, with most of its fingers not gripping the bar to a very meaningful degree, and its coordination is occupied with the shifting process. Furthermore, if you're someone who often rides out of the saddle from the hoods, you have to move your hand to the drop as part of the process. This all usually ends up being a little disruptive to pedaling form despite not having to sit down, although it's mostly a better situation than downtubes. Why do you think Benotto tape might be an issue? There's nothing wrong with the SunTour Bar-Cons, and they tend to be both more available and less costly than the retrofriction units. And they're still far better than the friction-only levers from Campagnolo and others. I always had a wrap of adhesive cotton bar tape (sometimes over inner tube strips) under my cellotape to enlarge the effective bar diameter slighter and improve comfort. I would think that this approach would alleviate any potential issues between bar end cable housing and celloptape. You’ll still have to sit down to shift. At at least I do. Darn. Can anyone shift while standing using drops or bar-ends? What's the trick? I seem not coordinated enough. Simplex Retrofrictions are not impossible to find. They are hard to differentiate from standard Simplex friction shifters, so sellers may not realize what they have. 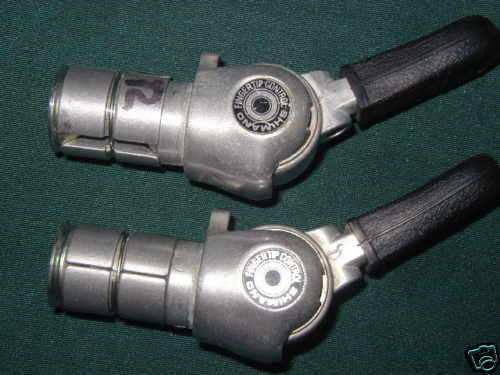 John Thompson is right, they work better with a demultiplicator relay to reduce cable pull. I'm not a fan of Suntour Barcons or any other friction shifters that ratchet. I love my bar ends, have OEM Campy on my Legnano, and recently built a Super Course with Suntour ratcheting bar cons. I like the feel of the Suntour better than the Campy, but really love them both. Just before Eroica, I was doing lots of vintage miles getting used to the damned toe clips, When I got on my modern Di2, I reached for the non-existant bar ends more than once. The Brooks bar wrap looks fat on the Raleigh because I went over the previous foam tape. Last edited by Slightspeed; 07-14-18 at 11:22 AM. I rode w/ Shimano barcons for Criterium racing for their quick/smooth operation and ST for the positive sturdy stay-put of ratcheting in the rough environment of cyclo cross "back when". One ST is still in service on the town bike functioning perfectly > 40 years on. As far as shifting while standing and putting the power down goes.....good luck with that. Last edited by Bandera; 07-14-18 at 11:47 AM. 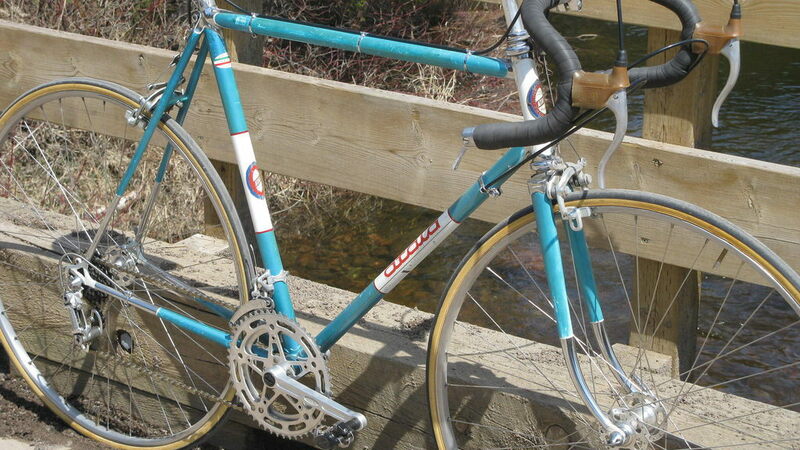 I got my blue Legnano Roma (pictured above) new in '64 and it came with Campy bar ends. I raced as a junior racer with them, and really hate to ride a bike with down tube shift. 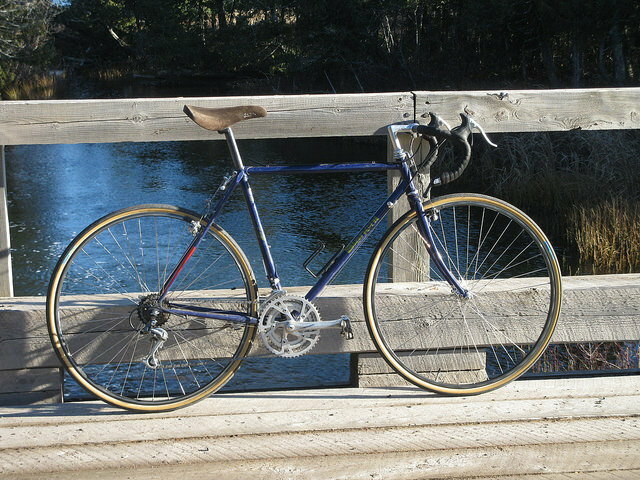 My old Contimental had dt, but we traded it in on the new Legnano. I had a Bianchi Forza for a short time with Shimano indexed dt, but it got killed by a car. I rebuilt it with a new frame, but had moved on to Sti brifters by then. When I built the Raleigh, it was a bare frame, so bar cons went on it too. I've heard that you should shorten the bar end by about 1" when you add bar cons ro avoid knee contact. In over 50 years of riding with them, I think I may have hit them 2 or 3 times. I'm 6' tall with fairly long legs too. I've never cut the bars off to fit the bar cons. Last edited by Slightspeed; 07-14-18 at 12:23 PM. 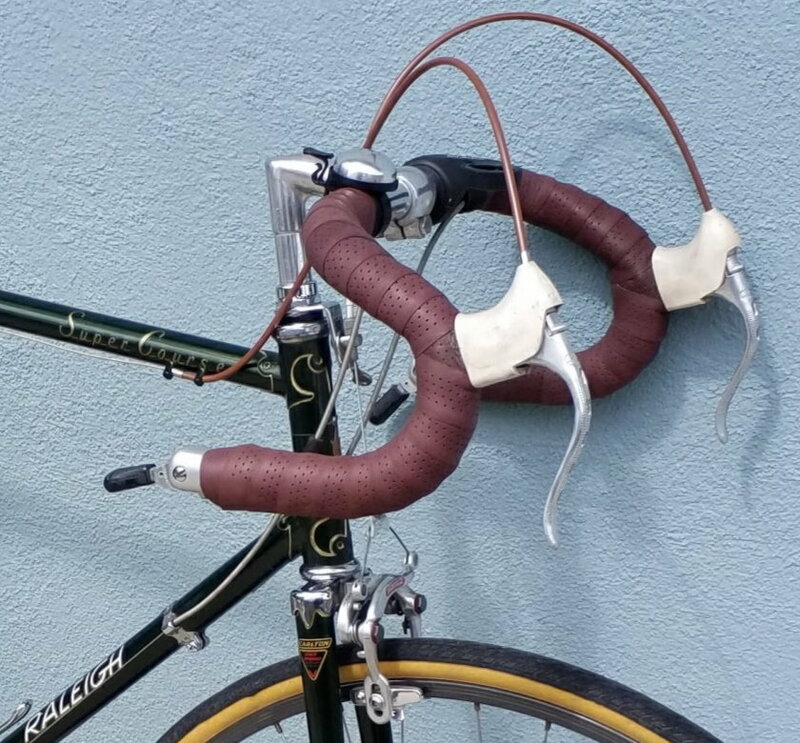 If you really wanted Simplex retrofrictions on bar-ends, and couldn't find the Simplex model, you could always mount the downtube models that fit Campy-standard braze-ons to the Riv "silver shifter" bar end mounts, no? A bit longer levers, though. I think bar end controls are often begging to have 15-20mm of bar trimmed off for aesthetics and knee avoidance when out of the saddle on a steep hill. Those shifters have that counter spring that seems to simply balance the derailleur spring-with no clutch. Unlike the clutched spring action of the Simplex Retrofriction shifters and unlike the ratcheting clutched action of the Suntour Power shifters. With no derailleur spring to counter the counter spring- the Shimano levers always return to the position above- there is nothing to hold the lever in place. Retrofriction shifters, with no cable or anything, the levers stay where you move them to. The clutch holds the lever in place. one of the vintage bike parts suppliers (sorry - the name of the company escapes me at the moment - Boulder Bike maybe??) 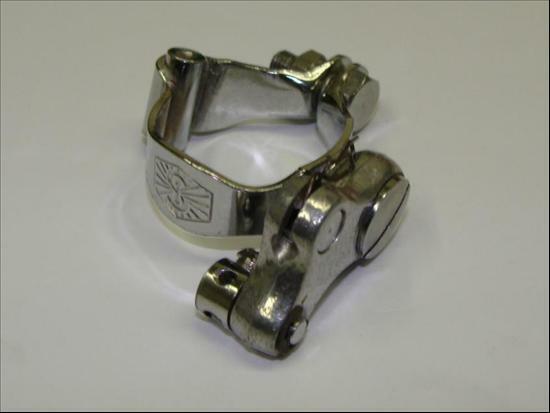 has been selling Cinelli “Diet Ebios” 26.0 NOS handlebars at clearance prices - these are extra short on the drops - perhaps these would be a good fit to work with bar end shifters. 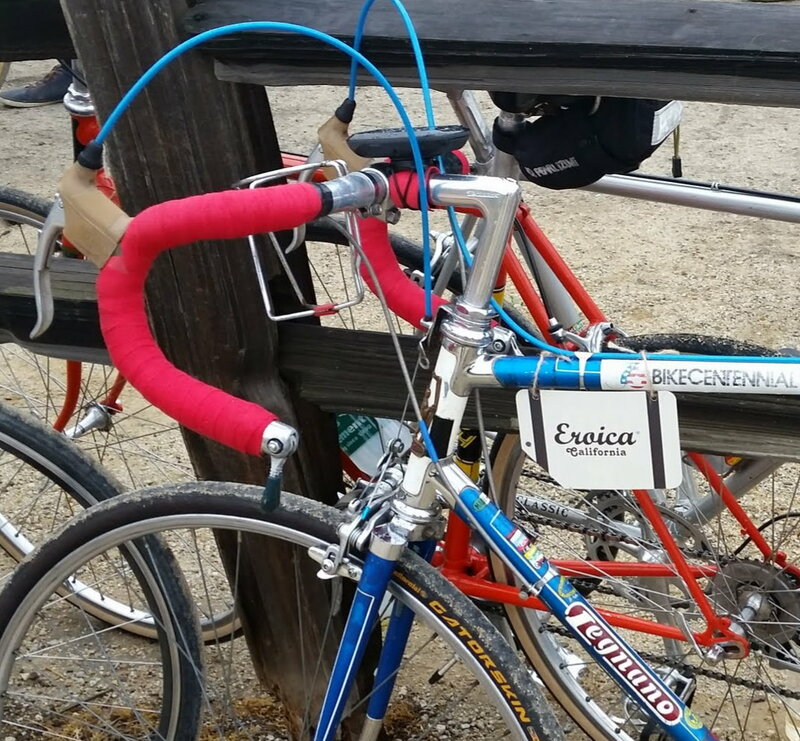 Edit - I just checked and Boulder Bicycle has the Diet Eubios in 26.4 (old school Cinelli diameter) only. They have some 42’s and some 44’s for 22$ each. Last edited by masi61; 07-15-18 at 12:14 PM. 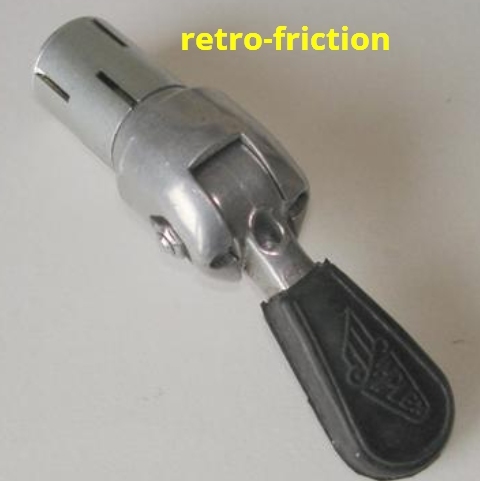 You're right, they are a different design from Simplex retrofriction levers, but the "feel" in use is very much the same, and quite different from a plain friction lever or even a SunTour ratcheting lever. I routinely shift my barcons whilst standing up. When standing up, you only need to balance the weight of your upper body since it’s leaning further forward. The following only usually works for me when standing up but not pumping at full racing effort. I imagine most people use some variation of this procedure. Full-grip on non shifting hand. On shifting hand, I half-grip the end of the bar using my thumb and forefinger, with the knuckle under my forefinger as my main vertical support. When moving the barcon lever “up”, I use my pinky or last two fingers. When moving the lever “down”, I push down using the lowest point of my palm (closest to my wrist). I’ve trained myself to use this procedure even when riding in the saddle. 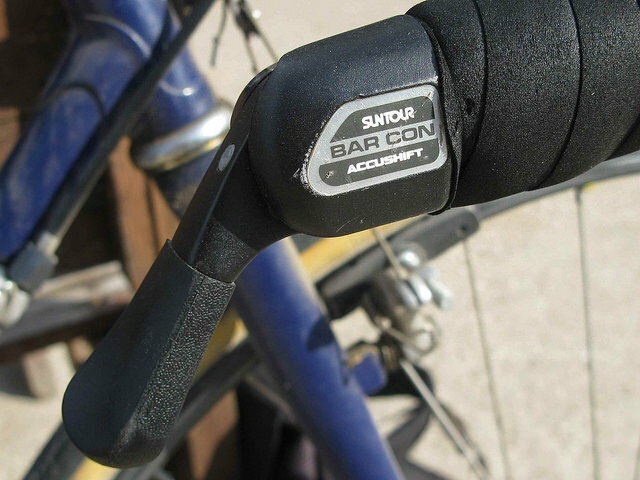 For reference, I have suntour accushift indexed barcons on my old specialissima commuter.